Keywords: Environment of China, Double Eleven, ban on online video game, increase in military budget, Blue House, national anthem law, five-day workweek law. According to a report published by the Ministry of Environmental Protection on 16 November, 1,140 environmental inspectors (环保督察), including 56 local party committee members and 130 department-level officials, were called to account for their responsibility over ecological damages in the eight provinces (Inner Mongolia, Heilongjiang, Jiangsu, Jiangxi, Henan, Guangxi, Yunnan, and Ningxia) they oversaw. Under the Xi’s administration, environmental protection has become one of the most pressing concerns as the government is attempting to fight pollution caused by decades of economic developments through law enforcement, and, thus, an important performance indicator used to evaluate government officials. The accused inspectors were charged for failing to manage pollution in their respective provinces (e.g. the worsening air quality in Henan). The disciplinary actions taken include investigation for criminal offenses and punishments within the party’s discipline. And unlike most government accountability in the past, many of the inspectors were publicly named and made to publicly apologize for their failed management. Originated as a non-commercial festival celebrating bachelorhood among university students in Nanjing during the 1990s, China’s Singles’ Day – also known as Double Eleven (双十一) or Guanggun Jie (光棍节) – on 11 November (the number “1” symbolizes a person who is single) has evolved into a nation-wide as well as the world’s largest online shopping gala where goods ranging from food to motor vehicles are sold at discounts. Initially launched by the Chinese e-commerce conglomerate Alibaba in 2009 to promote its online shopping website Taobao, Double Eleven’s sales are now competed among other e-commerce companies such as JD.com, despite Alibaba has previously registered trademarks associated with the festival in 2012 and 2013. With a total amount of sales increased from US$7.5 million in 2009 to US$25.3 billion in 2017, it is now the largest online shopping event on earth and is 18 times the total sales of Amazon’s Prime Day. With more than 1.5 billion items sold and 300,000 tons of waste produced during the Double Eleven event, this rapidly developing online shopping culture at the expense of the environment has indeed created a number of pressing problems which the country needs to deal with. For example, more than 70,000 parcels ordered on 11 November were delivered to and left on the pedestrian pathways at Peking University and Tsinghua University. With over 20 million copies sold globally as of November 2017, the world’s best-selling battle survival video game PlayerUnknown’s Battlegrounds (PUBG) was recently banned in China due to its violent contents and competitive spirit which, according to a statement issued by the China Audio-Video and Digital Publishing Association, deviate from the country’s core socialist values and Chinese culture’s traditional moral principles. Soon after the ban was announced, a number of local media companies (e.g. Tencent) have expressed interest in acquiring a publishing license from the game’s South Korean development Bluehole as well as create copycat versions that are deemed suitable for the Chinese market. For example, the Chinese internet company NetEase’s Wildness Action (荒野行动) and technology giant Xiaomi’s Xiaomi Gunfight (小米枪战) are among the two notable versions of the game developed by local companies. Topping the China’s Apple iOS store, Wildness Action addresses the Chinese regulator’s concerns by showing red banners with slogans that reflect the country’s socialist values such as “Safeguard national security, safeguard world peace” (维护国家安全，维护世界和平). Commentators have suggested that the ban on PUBG signals China’s increasingly vigorous policing of video game cultures and technology companies. The publication of Silent Invasion: How China is Turning Australia into a Puppet State – a book by Clive Hamilton, a prominent professor at Charles Sturt University, examining the Chinese Communist Party’s activities in Australia was pulled by the leading Australian publisher Allen & Unwin in early November. According to an email by the publisher where the author has published eight previous books, the decision to delay publication was made due to “potential threats to the book and the company from possible action by Beijing”, despite the book has gone through several rounds of significant editing by lawyers. Seeing this as “a watershed in the debate over China’s suppression of free speech”, Hamilton pointed out that it was “the first instance where a major Western publisher has decided to censor material of the Chinese Communist Party in its home country”. Having requested the Allen & Unwin to return his rights, Hamilton is currently seeking other potential publishers to bring his book into publication. The episode came after a recent series of self-censorship in global academic publishing such as the University of Cambridge journal China Quarterly and the German publishing house Springer Nature (home to Springer and Palgrave Macmillan) who removed access to their articles containing politically sensitive topics from readers in China. Announcing in front of 2,300 delegates in the Communist Party meeting held in October, Xi Jinping called to build a military power of world-class standard by the mid-21st century. In early November, the Central Military Commission has moreover added a new guideline requesting the Chinese military force consisting of more than two million personnel to pledge absolute loyalty to and follow the command of President Xi. Commentators, such as James Char, suggested that such moves to modernize the Chinese military indicate that Xi has consolidated and further centralized his power due to his earlier crackdowns on high-ranking army officers for corruption. Although China has increased its military spending over the last 30 years and actively displayed its military activities, its military budget remains one-fourth of that of the US. With the increase in military spending, it is expected that China will continue to defend its territorial claims over the South China Sea as well as establish overseas military bases following the opening of its first foreign naval base in Djibouti in August this year. Arriving in Hanoi after attending the Asia-Pacific Economic Cooperation summit (APEC) in Da Nang, Xi Jinping met with Nguyen Phu Trong, the current General Secretary of the Communist Party of Vietnam, to discuss the China-Vietnam relations and maritime issues on 12 November. On 13 November, a joint statement was issued saying that a consensus has been reached over the disputed areas in the South China Sea. As an effort to enhance the bilateral relations, a series of deals amounting to US$1.94 billion were signed before and during Xi’s official visit, including agreements on e-commerce cooperation and building a border trade zone. Other than the joint statement and cooperation pacts, Xi moreover referenced the shared revolutionary history of China and Vietnam (two of the five remaining communist states in the world) as well as China’s support for Ho Chi Minh against the US during the Vietnam War. These diplomatic exchanges between the two countries are seen to reflect, on the one hand, Beijing’s growing concern over Hanoi’s increasingly close relations with the US and, on the other, Hanoi’s ambition to benefit from China’s Belt and Road initiative, despite of Vietnamese residents’ growing disdain for China’s economic control over the region in recent years. Being one of the few remaining balcony-type tenement buildings in Hong Kong, Blue House won the highest award in this year’s UNESCO Asia-Pacific Awards for Cultural Heritage Conservation. 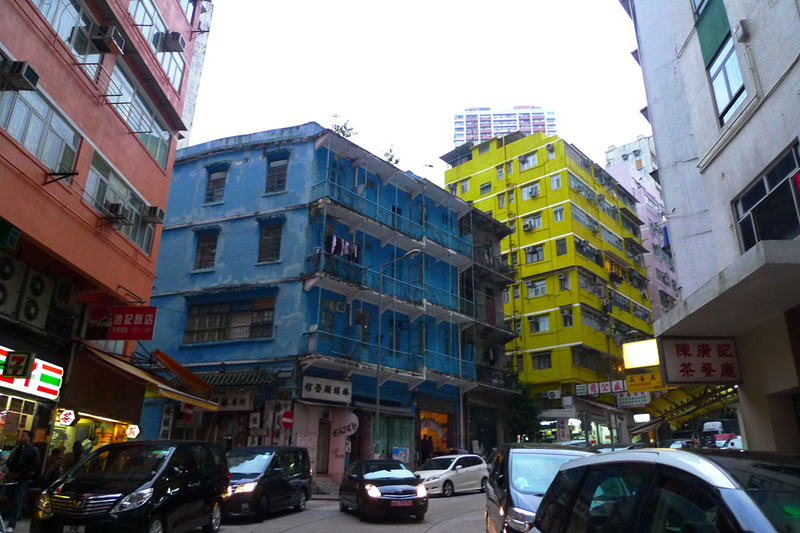 Symbolizing the working-class community in Wan Chai, the block of tong lau (唐樓) named after its distinctive color has been operating as a shophouse block in the last 95 years. Although Blue House was once threatened with demolition and wholesale redevelopment, it was safeguarded by an inclusive, grassroots advocacy alliance comprised of tenants, social workers, and other preservation specialists. The jury wrote in a citation, “This unprecedented civic effort to protect marginalized local heritage in one of the world’s most high-pressure real estate markets is an inspiration for other embattled urban districts in the region and beyond”. Unique in the history of urban renewal in Hong Kong, many residents of the building, with the support by St James’ Settlement – a charitable organization selected to oversee the redevelopment project, stayed on-site during the construction process and maintained their community networks. As a result of this internationally acclaimed success, Blue House is expected to become a model to encourage civil society-led, bottom-up urban revitalization projects in the future. Soon after China has recently passed a new law that punishes people who disrespect the national anthem (“March of the Volunteers”) to 15 days of administrative detention and three years of imprisonment, the National People’s Congress Standing Committee has formally inserted the law into an annex of Hong Kong’s Basic Law. While the Chief Executive Carrie Lam has publicly declared that the “legislation does not carry any particular scope for politicization”, pan-democrat legislators have warned that the law would undermine Hong Kong’s freedom of expression under the “one country, two systems” framework. In the absence of a public consultation, they have moreover requested guidelines concerning law enforcement. Legislator Tanya Chan is worried that “Hong Kong schools could become like those in China, where students are gathered every day to sing the anthem and salute the national flag”. Nevertheless, legal practitioners, such as Dennis Kwok, have pointed out that much of the law would be difficult to implement in Hong Kong where 15 days of administrative detention is non-existent in the common law system. The public debate in Hong Kong over the need and possibility of a national anthem law started in 2015, when Hong Kong football fans booed the national anthem during a World Cup qualifier and subsequent footfall matches where the national anthem was played. The Cabinet under Tsai’s administration has recently proposed for a revision of the Labor Standards Act (勞動基準法) that was implemented on 1 January this year. Known publicly as Yili Yixiu (一例一休, one fixed day off and one flexible rest day), the working day reform policy guarantees workers to get two days of leave in every seven days, including one fixed day of mandatory holiday and one optional rest day. After almost a year of observation, employers and workers alike – especially those in small businesses and in the travel and transportation industries, however, have complained that the policy was too rigid and allowed little flexibility. In response to their concerns, the amendments would change the maximum consecutive working days from seven to 12, and maximum overtime hours from 46 to 54 per month (but limited to 138 hours every three months). It would also allow workers to accumulate unused leave for up to a year. Although the proposal is generally welcomed by much of the Taiwanese population (66.6%) as shown in a recent opinion poll, a number of labor rights groups and politicians have, however, criticized the amendments for allowing big businesses to exploit employees by requesting them to work longer overtime hours.